The Department of Anatomy and Cell Biology requires that a Deed of Disposition be on file in the department prior to the donor's death. The department will provide the legal forms which require only a few items of information, the donor's signature, and the signatures of two witnesses. A brief medical history form must also be completed and returned to the department with the original of the completed Deed of Disposition. Following receipt of these documents the department will acknowledge acceptance of the deed, review the information, and issue an identification card if the applicant meets the necessary criteria. By law, a medical college may not purchase any human body. 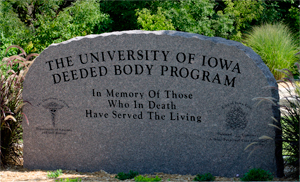 Please note: A Uniform Donor Card is not sufficient for whole body donation to the UI Department of Anatomy and Cell Biology. A Deed of Disposition and medical history form must be on file with the department prior to the donor's death. At the time of death, the person in charge of the donor's affairs should select and notify a funeral director and make arrangements concerning transportation to Iowa City and any other professional services needed or desired. Only donors transported by a licensed funeral facility will be accepted. If desired, visitation and a traditional funeral service may be held prior to the transfer to Iowa City. If there will be a delay of more than eight hours because of a funeral service, distance, weather, et cetera, embalming will be necessary. The cost of transportation and the funeral director's professional service fees must be borne by the family or estate.